Bisphosphonates are a class of drugs used for the treatment of diseases related to excessive bone resorption including osteoporosis, Paget’s disease, and metastatic cancer in bone.1 They also show promise in other applications as cancer drugs, antiparasitics, and immunomodulatory and antiviral agents.2 In bone disease applications, they act by binding to the surface of the bone mineral hydroxyapatite and inhibiting its resorption by osteoclasts. Many bisphosphonates have been synthesized and explored, and more than a dozen have been tested in humans.1 Four bisphosphonates, alendronate, risedronate, ibandronate and zoledronate, have been shown in clinical trials to reduce the incidence of fracture and have been licensed for the treatment of postmenopausal osteoporosis. 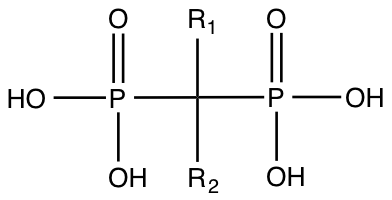 What do bisphosphonates look like? And what is their mechanism of action? The binding interactions of bisphosphonates with hydroxyapatite are extremely important to their therapeutic action in vivo. Bisphosphonates with different binding affinities will differ in uptake, distribution on the skeleton, duration of action, diffusion within bone.4 These properties affect the potency and side effects of the drug in clinical use and are thus of great interest to pharmaceutical researchers. In order to study uptake an distribution in the skeleton, binding to hydroxyapatite, and uptake by osteoclasts, many fluorescently labeled analogues of bisphosphonates have been developed.5,6 One powerful method for producing labeled analogues employs an epoxide ring-opening reaction to introduce a primary amine functionality to N-heterocyclic bisphosphonates and phosphonocarboxylates.7 The amine-functionalized molecules can then be labeled using readily available activated-acid fluorophores. These analogues have been used to study the skeletal distribution and uptake of bisphosphonates by various cell types in vivo, giving insight into their mechanisms of action and potential effects.5,8 Bisphosphonates labeled using this technique generally retain the relative binding affinities of the parent compounds. Using fluorophores with different emission ranges, they can be used for simultaneous studies of multiple bisphosphonates with different affinities to elucidate their relative distributions in bone and cells.6 These kinds of studies can shed light on reasons why different drugs have different efficacy and side-effect profiles and help screen novel drug candidates with respect to distribution and binding affinity. Given their effective therapeutic use for a wide range of diseases and their potential to treat other conditions, bisphosphonates and phosphonocarboxylates will remain a topic of intense research for some time. Fluorescent labeling has given considerable insight into their behavior both in vitro and in vivo and will continue to be an indispensible technique in bisphosphonate research. 1. Russell RGG. Bisphosphonates: The first 40years. Bone. 2011;49(1):2–19. doi:10.1016/j.bone.2011.04.022. 2. Ebetino FH, Hogan A-ML, Sun S, et al. The relationship between the chemistry and biological activity of the bisphosphonates. Bone. 2011;49(1):20–33. doi:10.1016/j.bone.2011.03.774. 3. Kavanagh KL, Guo K, Wu X, et al. The molecular mechanism of nitrogen-containing bisphosphonates as antiosteoporosis drugs. PNAS. 2006;103:7829–7834. 4. Nancollas GH, Tang R, Phipps RJ, et al. Novel insights into actions of bisphosphonates on bone: Differences in interactions with hydroxyapatite. Bone. 2006;38:617–627. doi:10.1016/j.bone.2005.05.003. 5. Roelofs AJ, Coxon FP, Ebetino FH, et al. Fluorescent risedronate analogues reveal bisphosphonate uptake by bone marrow monocytes and localization around osteocytes in vivo. J Bone Miner Res. 2010;25(3):606–616. doi:10.1359/jbmr.091009. 6. Sun S, Błażewska KM, Kashemirov BA, et al. Synthesis and characterization of novel fluorescent nitrogen- containing bisphosphonate imaging probes for bone active drugs. Phosphorus Sulfur Silicon Relat Elem. 2011:970–971. doi:10.1080/10426507.2010.526674. 7. Kashemirov BA, Bala JLF, Chen X, et al. Fluorescently Labeled Risedronate and Related Analogues: “Magic Linker” Synthesis. Bioconjugate Chem. 2008;19(12):2308–2310. doi:10.1021/bc800369c. 8. Roelofs AJ, Stewart CA, Sun S, et al. Influence of bone affinity on the skeletal distribution of fluorescently labeled bisphosphonates in vivo. J Bone Miner Res. 2012;27(4):835–847. doi:10.1002/jbmr.1543.